Baseball Hall of Fame pitcher Eddie Plank was born 10 years following the Civil War on his family’s farm north of Gettysburg. 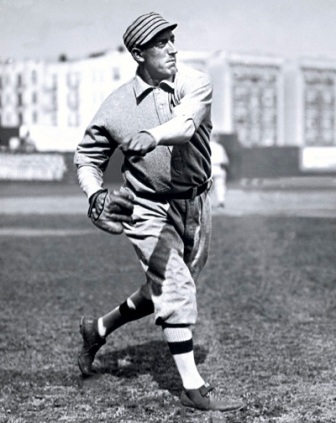 Although Plank would eventually become the first major league southpaw to win 300 games, he is rarely mentioned with other great players of his era. Our mission is to provide a tribute to Gettysburg’s legendary son and the era in which he pitched. Although Eddie Plank did not attend Gettysburg College, he did pitch for the college baseball team from 1900-1901 prior to entering the big leagues. In 1901, Eddie was signed by Connie Mack to pitch for the Philadelphia Athletics on the recommendation of his friend, Gettysburg College coach, Frank Foreman. In 1910, the A’s defeated the Chicago Cubs (4-1) to win their first World Series. The 1911 A’s continued their dominance defeating the New York Giants (4-2) in the fall classic. Connie Mack’s 1910-1911 A’s earned the distinction of becoming the first team to win 100 games in back-to-back seasons and becoming the first AL team to win back-to-back World Series. Following a disappointing season in 1912, the A’s rebounded in 1913, winning the AL pennant. They defeated the Giants (4-1) in the World Series, becoming the first team in either league to win three World Series in four years. Eddie was named the 1913 World Series M.V.P. after out-dueling Christy Mathewson in the fifth and final game. Eddie played for the St. Louis Terriers in 1915 and finished his career with the St. Louis Browns from 1916-1917. After retiring, Plank opened an automobile garage on York Street in Gettysburg in 1923. Three years later, Eddie died from a stroke at the young age of fifty. He was inducted into the Baseball Hall of Fame in 1946. He currently ranks 13th on the all-time wins list. Edward Stewart Plank is buried alongside his wife, Anna C. Myers, at Evergreen Cemetery along Baltimore Street. In 2009, “Gettysburg Eddie’s“, a restaurant dedicated to his career was opened in Downtown Gettysburg, PA. Visit it today to learn more about this fascinating Gettysburg legend.